1. 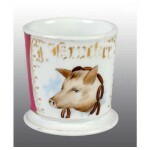 Animal Head Mugs – These are primarily the head of a pig or steer and can also have images of a cleaver or knives occasionally. 2. 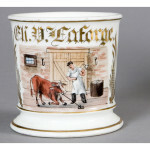 Slaughterhouse Mugs – These are mugs with scenes showing an animal tied down about to be killed. 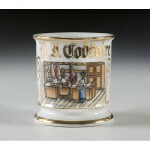 The butcher is usually in mid swing with an axe in these mugs. 3. 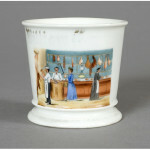 Store Scene Mugs – These mugs feature the image of the inside of a butcher shop and usually the butcher is assisting a female client or handing her a package of meat. 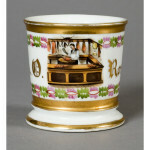 Other related mugs can be found as well such as mugs for Meat Delivery Wagons, or other variations. 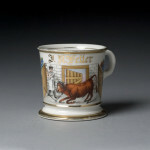 Butcher mugs can be fun to collect because even within the category there is a good amount of variety and a number of different designs to collect.